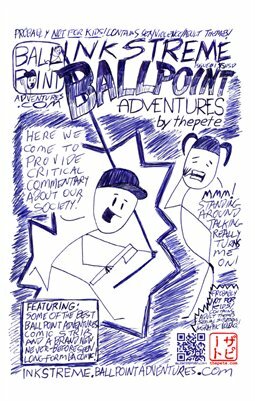 Ballpoint Adventures: Every Wonder Why Some People Insist on Speakerphone Calls in Public? Billy finds out why! Every Wonder Why Some People Insist on Speakerphone Calls in Public? Billy finds out why! Sadly, very few people are ever honest enough, or self-aware enough to admit when they are being idiots. Some of us, CAN admit it. Like me, for ever thinking humanity could ever be even generally this honest or self-aware. I'm an idiot to hope for it. I'll hope anyway though! My cynicism be damned! DUDE! Drawing comics for free every week is actually hard work--throw me a couple bux on Patreon, wouldja? Thanks! Or just buy me a cuppa joe!